Colour sketch perspective of Woodhill House and Gardens. Title: 'Woodhill House Barry. 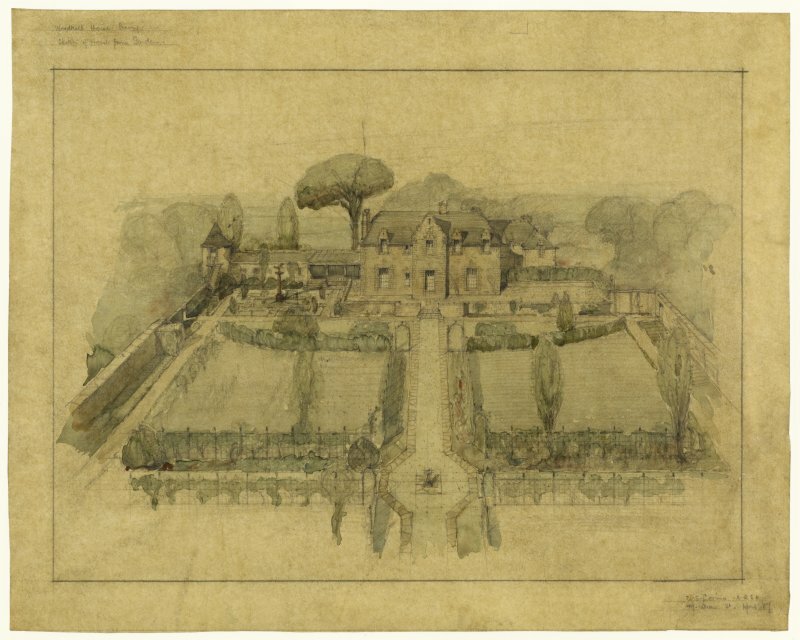 Sketch of House from Garden'. 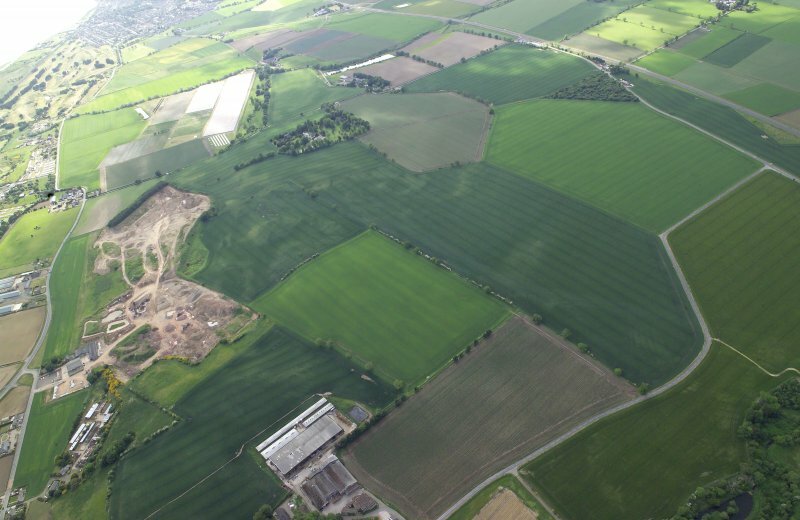 General oblique aerial view centred on the cropmarks of the possible enclosure and rig with the country house and cropmarks of the possible souterrain adjacent, taken from the ENE. 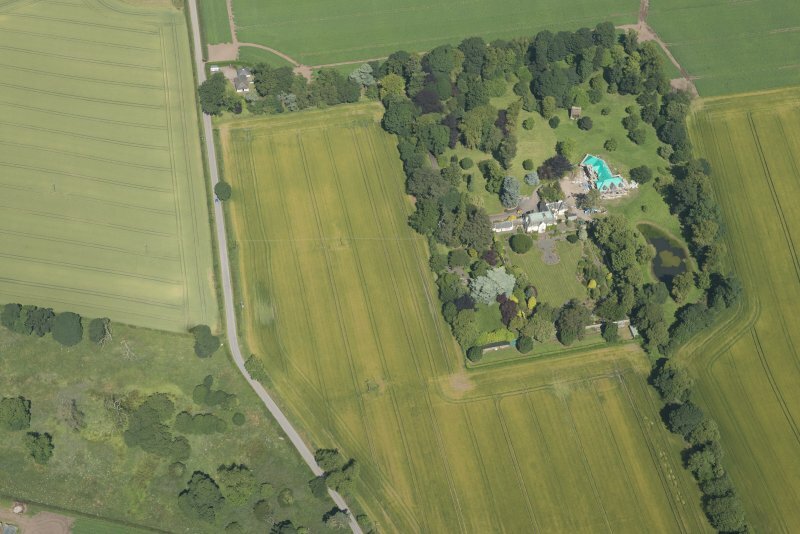 Oblique aerial view of Woodhill House, looking NNW. 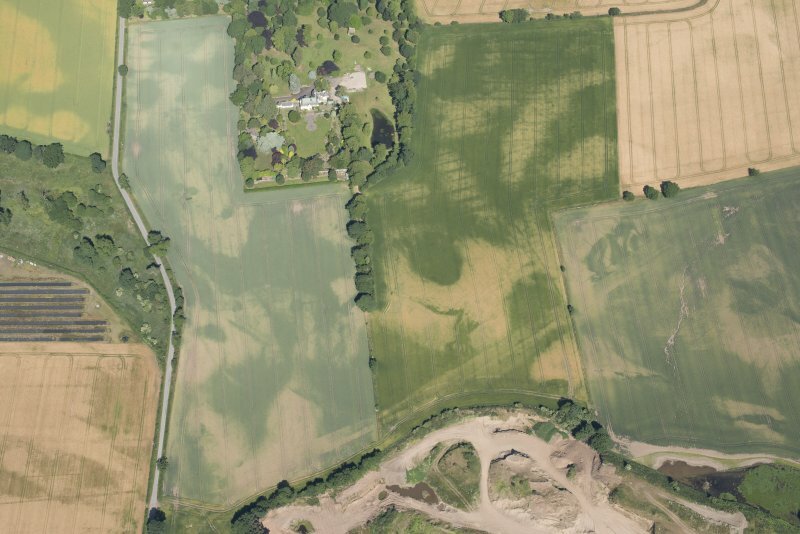 Oblique aerial view of the cropmarks of the rig, houses and pits with Woodhill House adjacent, looking NW. Architect: Sir Robert Lorimer 1907-9 additions and alterations. (NO 5215 3446) Woodhill mansion is an old building, but its date of erection is uncertain. It was built by the Auchinleck family who were granted the estate in 1532. It is a plain building, and on a slab over the doorway of the courtyard are the initials J K - H F and the date 1700. Over the door of the inner courtyard is a stone bearing the date 1604 and the initials W A - M D. Other datestones at Woodhill - 1752, 1773, and 1704 - are from Carnoustie House. Built into the dovecot (at NO 5212 3455) is another stone bearing the Auchinleck arms and the beginning of a date 16--. Woodhill House is entirely modern and is dated 1908. No early structure was noted. Some of the stones mentioned by Warden are still to be seen built into the walls of the buildings. The rectangular ruined dovecot is of typical 17th - 18th century date. Its datestone lies on the ground at its base; the date is illegible. Visited by OS (JLD) 19 May 1958. NO 5215 3451 A watching brief was carried out in February 2001 on a development in the grounds of Woodhill House. The present mansion dates to 1908 but this lies directly on the site of a much older building. 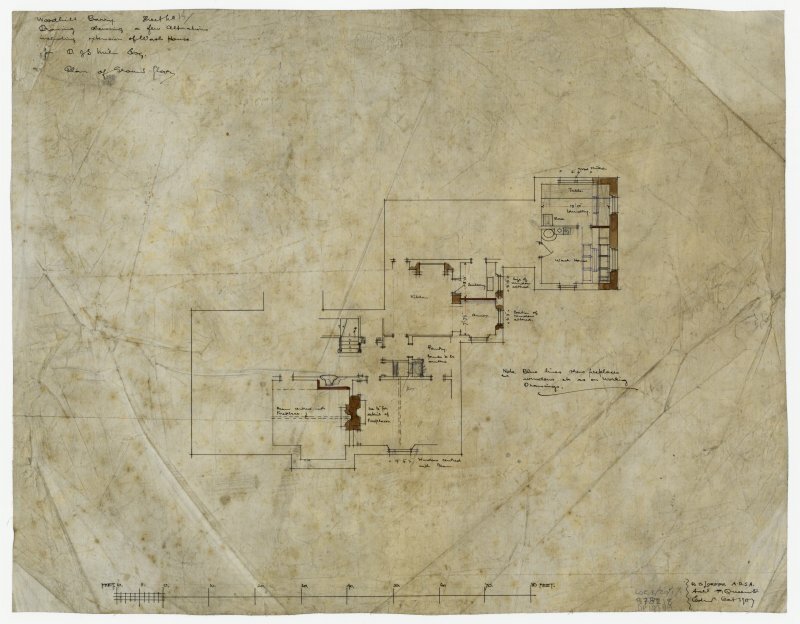 This watching brief was intended to pick up any remaining traces of the original mansion building, its outbuildings or landscape garden features. In one trench, situated next to the walled garden, a stone-built culvert was uncovered. This was the only archaeological feature recorded. (SUAT CA02).